We even met Nantucket’s incredible photographer and videographer Dan Driscoll. 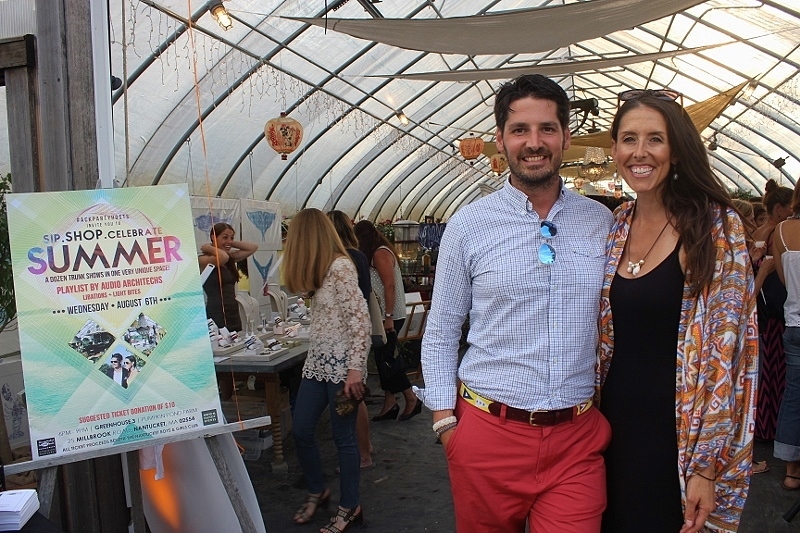 Over 12 vendors participated in an evening of libations, fashion and fun! If you missed this event at Pumpkin Pond Farm in Nantucket. The Nantucket blACKbook has a full calendar of events on Nantucket. Did you catch the pre-party at the Boston Pops or the MICHAEL KORS fashion show on Nantucket last night. If your not on Nantucket yet this Summer you still have time! Nine Years ago, Holly Finigan stepped foot on Nantucket….And Things Will NEVER be the same for Nantucket! Yes, Holly worked as a bartender, a freelance writer, created her popular blog and in May 2012 launched the website that has become The GO-TO Source for ALL Things Hip + Fresh + Haute + Cool on the 02554! 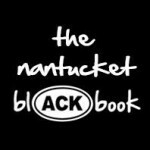 The Nantucket blACKbook is THE Online Guide Connecting those on and off the island with all things hip and fresh. It is the brainchild of Holly Finigan. We recently spoke with Holly, discussing her website and life on Nantucket. Holly and her creative team under her direction, bring a FRESH ACK look to promote all things Nantucket from fashion, style, restaurants, events, shops and festivals! “What They Are Wearing” What They Are Buying” “What To Wear To A Music Festival or a Wedding” That’s just the tip of what Holly Finigan wants you to know what The Nantucket BlACKbook is about! She works with the leaders in the industry on Nantucket which are part of her own team creating the Fresh look That is Nantucket! The Nantucket BlACKbook showed The World, Nantucket’s Red, White and Blue this past JULY 4TH! This weekend they will be at the island’s Yoga Festival, Then there was was the Wine Festival, The Book Festival, The Film Festival and coming July 16th The Comedy Festival, The Dance Festival (July 21 – 26), The Garden Festival (July 23-24) and of course The Nantucket Music Festival (August 2-3) with Bruce Hornsby and many others. Nantucket BlACKbook will be there for all of it as well as promoting the events in advance only in the way they can! Holly’s features have appeared in Nantucket Magazine, she also freelances for editorial pieces from Boston to NYC and received notary in the August 2013 VANITYFAIR Society Coast to Toast article about Erosion. Holly is also on the Nantucket Chamber of Commerce Board. Timeline…Nantucket Stroll December 2013 – The Nantucket BlACKbook photo spread taken to promote the month long celebration that attracts visitors from around the world. Timeline…April 2013 Nantucket Daffodil Festival photo spread about the flower festival over a weekend in early Spring each year. 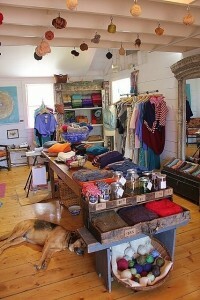 We found the coolest shop and it’s on Nantucket! Isobel and Cleo takes residence in one of the many upscale shops that dot the harbor in Nantucket when you get off the boat. No visit to Nantucket would not be complete without an enjoyable walk at Straight Warf and old South Warf to visit these colorful ocean shops. The Shop on Nantucket also includes other artists made goods from Nantucket. Isobel and Cleo design and create the most unique and luxurious knitwear right from their shop and studio on Nantucket. 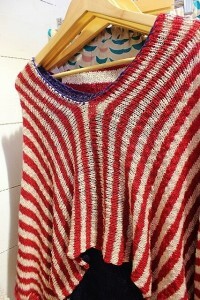 From sweaters to pants, scarfs and other unique items it’s a MUST STOP on your trip to Nantucket. They are at the shop right where you get off the boat in Nantucket from June through mid October and back to their studio at 2 Union Street the rest of the year. 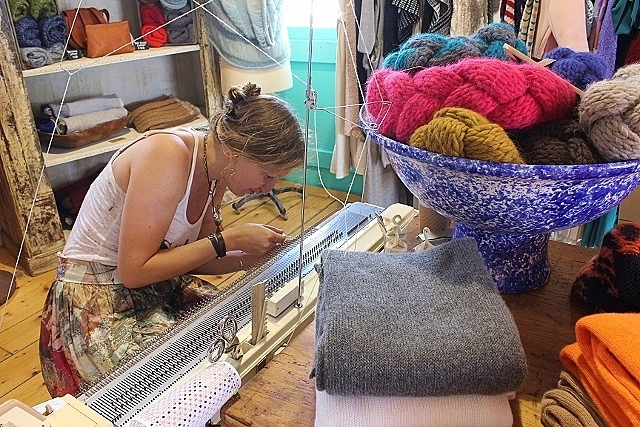 Owner, Charlotte Hess picked up knitting needles at the age of 8. In School she studied a semester abroad in Scotland. Upon her return to the USA she transferred to the School of the Art Institute of Chicago where she received a BFA in Fine Arts and Fashion. She Interned with Karen Walker and Nom#d in New Zealand and received her Masters Degree from Glasgow School of Art. Her ESTY Shop led to her starting her own brand, numerous blogs that were written about her fashions led to a grant awarded by the Scottish Arts Council. She was eventually headhunted by the URBN Corporation, parent company to URBAN OUTFITTERS and ANTHROPOLOGIE to design sweaters for their FREE PEOPLE brand. In March 2011, Charlotte won the Emerging Designers Competition at Charleston Fashion Week. She spends her time in her workroom on Nantucket and the UK. Every piece is designed and handmade on Nantucket Island. When away, Charlotte scours the globe looking for the best materials for her collection and chooses to work with companies that have fair workers rights practices and/or produce sustainable yarns. 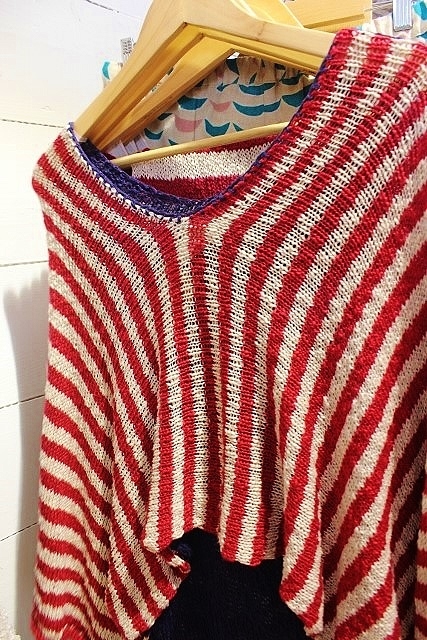 The brand is sold online and in stores in New Zealand, Scotland, Vermont, and California, Custom Knit garments are also created for private clients. 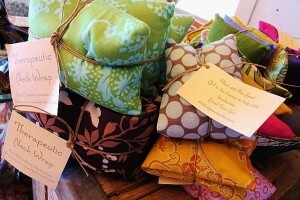 Charlotte’s work has been featured in Lucky Magazine, N Magazine, Nantucket Today, and Nylon and Elle Magazine’s blogs. 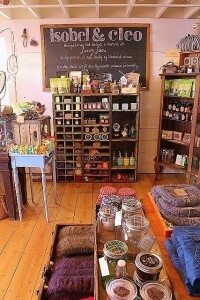 We have visited Midnight Farm several times over the years and loved the atmosphere and mood of the store. This year we found out they moved to a space across the street from where they had previously been. Midnight Farm is a HOME store that represents Tamara Weiss’s passion for all things beautiful, textural, organic, reclaimed, hand made or unique. Tamara travels the world and gains inspiration from the artists, musicians and friends she meets along the way, including her friend and business partner, Carly Simon. Tamara and Carly have been lifelong friends. The store was named by Carly Simon who also penned a poem which led to a children’s book called “Midnight Farm”. The shop is big on comfort and style. Tamara Weiss carefully curates the unusual selection of goods: furniture, bedding, art as well as clothing, jewelry and shoes for women, men, and children. The store pays homage to Vintage textiles from Morocco, India and Turkey sit side by side with luxurious silk bedding, candles, perfumes, books and treasures for the HOME, BODY and SPIRIT. 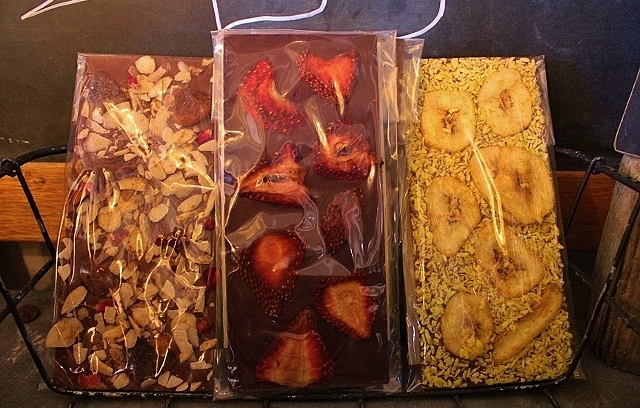 Specialty foods like local honey, sea salt, spicy kale, organic small batch granola, bacon jam, chocolates, and the ever-present mango lime salsa are some of the delectable foods one might find. 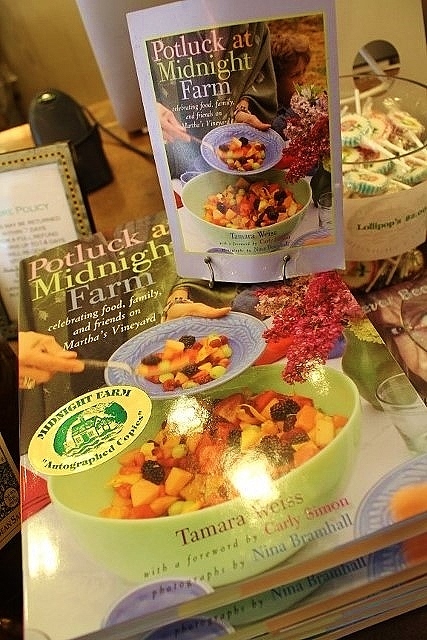 You’ll also find copies of Tamara Weiss’s book “Potluck at Midnight Farm”. Released in 2002, the cookbook style guide gives over 100 recipes from potluck dinners hosted or attended by the author. Turns out one of the biggest lavender farms on the east coast is in Harwich on Cape Cod! Cape Cod Lavender Farm is surrounded with 60 acres of conservation land with woodland and walking trails that overlooks Island Pond. Owners Cynthia and Mathew Sutphin have owned the farm since 1995. That’s the year they opened their farm to local’s to attend a harvest. The lavender farm is typically in bloom late June through early July. 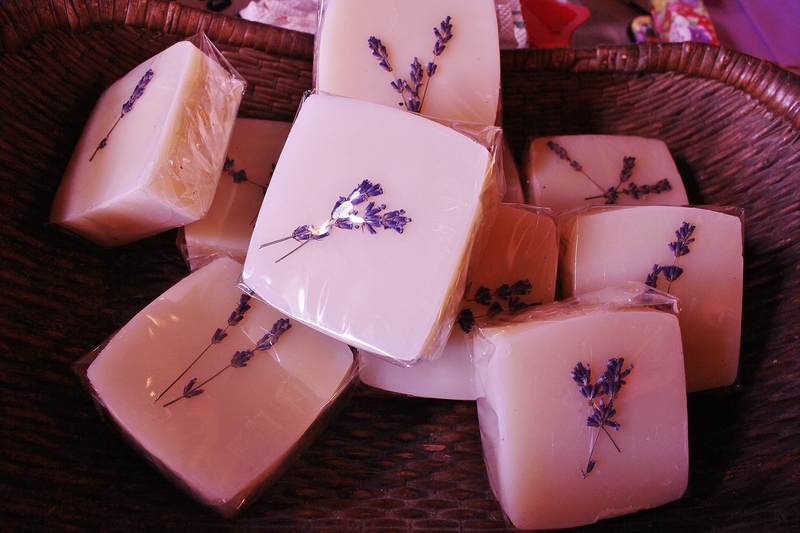 They started the business with two best selling products, plants and loose lavender buds and 19 years latter have over 20 lavender products; which include home decor, culinary and mind, body and spirit needs. In 2013, they expanded their enchanted garden, complete with a miniature replica medieval castle. The garden allows children and adults to let their imagination run among a variety of plants and faerie portals. June and July is harvest times and the best time to explore the fields bloom and scents. The farm receives 10,000 visitors annually. Don’t forget to visit the gift shop! Vanderbilt’s, World Cup Yacht Racing, the Kennedy’s and more! In 1947, E.L. Goodwin bought the rights to build the Herreshoff 12 1/2 known for decades as the preferred small craft of Newport by many including the Vanderbilt’s. Designed by Nathaniel Herreshoff and known for a long line of racing boats that helped keep the American Cup in America. Cape Cod Ship Building Company (CCSBC) have been builders of fine sailboats for over 100 years. In 1885 Myron and Charles Gurney manufactured wagons, carriages and wagon wheels for Tremont Nail and other Wareham companies. With the invention of the rubber tire, the Gurney Brothers knew they needed to shift gears. While occasionally building small skiffs for personal use in 1899 a new venture was decided. The Gurney Brothers named their new business Cape Cod Power Dory Co. Charles did the drafting and designing. During this time CCSBC built wooden pleasure and commercial boats including Coast Guard Boats. The Gurney Brothers made a variety of boats in all sizes. In 1919, plans to build the Narrows Bridge were underway which would close Cape Cod Poer Dory Co off to Buzzards Bay. They moved to their present location at 7 Narrows Road with 1500″ of water frontage and changed their name to Cape Cod Shipbuilding Corp. In 1925, The Cape Cod Knockabout was designed and quickly became the most famous of Gurney’s designs. The Knockabout evolved in a competitive first design fleet which is still active today. Ownership of CCSBC was passed to G.S Williams in 1935 after the death of Charles Gurney. In 1928, E.L. Goodwin; President of Undercliff Boatworks in New Jersey, a dealer for Cape Cod boats came to speak with Cape Cod Shipbuilding regarding a recent decline in quality and ended up purchasing the company. In 1940 the Sparkman & Stephens designed Mercury was purchased and over 200 were built of wood between 1940-1952. During WWII CCSBC began production of war tugs and launches for the military. E.L. Goodwin traveled to Washington to secure building contracts and required that the boats being built drew under 15″ in order to navigate the Wareham River. This in turn ment relatively smaller boats were being built at CCBSC. In 1943, One and a half 40″ tugboats were built a week and the company went from 1 to over 100 employees. After the war, CCSBC was able to easily switch gears from the tugboats and launches to small pleasure boats. Shipyards building larger boats were not able to make this transition and consequently many went out of business. In 1947, all boats designed by Nathanael Herreshoff were purchased by CCSBC. Wooden Herreshoff H12 1/2’s continue to be built at CCSBC. After learning that the military was interested in fiberglass boats during one of E.L.’s trips to the Pentagon, E.L. worked with Mr. Bell of American Cyanamid in New York to build fiberglass products. The first fiberglass boat built by CCSBC was a model made under the office. E.L. created air tanks within boats to allow them to float even when filled with water. CCSBC went on to create the first fiberglass modeling room with concrete floor and fireproof walls. 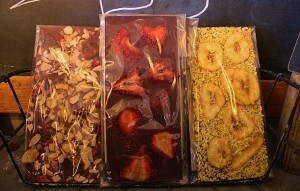 The ceiling was low and there were no windows in order to keep a steady temperature for consistent curing of the resin. In 1951, the first fiberglass Raven’s were built. Eight were delivered to the U.S. Coast Guard Academy. Jack Daphney went to Aloca in 1952, which at the time was the only manufacturer of aluminum spars; to purchase spar dies for boats. He came home with the rights, extrusions and tools for all the aluminum spar building line. Zephyr Spars became a division of CCSBC. Three of CCSB boats are in the prestigious flotilla at the Kennedy family compound; Ted Kennedy’s “MYA”, Eunice Shriver’s “Roses of all Roses” and Caroline Schlossberg’s “Snapdragon” are all Herreshoff 12 1/2’s. E.L. worked with Cornelius Shields in 1962 to develop a boat for maritime cadets to understand how sailboats maneuver…the result is the Shields Class One Design designed by Sparkman & Shields. Cornelius Shields a dedicated believer in one design racing knew maritime cadets were learning to operate ships with no knowledge of the maneuverability of a sailboat. The class today remains a strict one design with fleets throughout the country. Gordon L. Goodwin became President of CCSBC in 1979. E.L. Goodwin passed away July 1994 at the age of 95. 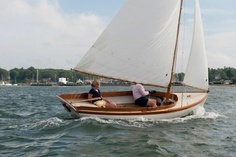 Today, Cape Cod Shipbuilding Co and the Goodwin family continue to offer traditional fiberglass sail boats from 9 to 49 feet built in Wareham. It’s a family business going on tree generation with Wendy J. Goodwin serving as Vice President….And the boats their family built are being handed down generation to generation! In 1910, Romeo Paulus was employed by a shoelace manufacturing company in Plainville, Massachusetts. He realized the same braiding process used in the production of shoelaces, could be applied to braided rug production. Romeo modified the machinery used in shoelace production, producing the first machine-made braided rugs in the United States and started the Plainville Rug Company. Over the years, the company grew producing many different lines of braided rugs with distribution through the United States. The Paulus family moved to Cape Cod and the Cape Cod Braided Rug Company was founded in the early 1970’s. Over the years the company has grown, but the family tradition of handcrafted excellence, quality and the process used to produce braided rugs has not changed dramatically since that first braided rug produced by Romeo Paulus in 1910. Today, tours are available at their Harwich manufacturing facility. These rugs are made of 100 percent wool…a natural “green” fiber and are unique one of a kind rugs available in custom colors and sizes up to 16 feet. Christmas Card List Turns Into Great Idea! In 1945, Vrest and Ellen Orton printed their first catalog. It was just 12 pages and 36 products, but they mailed it to the folks on their Christmas card list! The rest as they say is history! Founders Vrest and Ellen Orton built a business as purveyors of the practical and hard to fin. Vrest was a frugal Yankee at heart and insisted that the merchandise be durable and above all practical. His wife Ellen, who grew up on the Wilcox dairy farm in nearby Manchester, Vermont made certain the new business was as practical as the products it sold. Decades latter….the Orton family still holds this value. 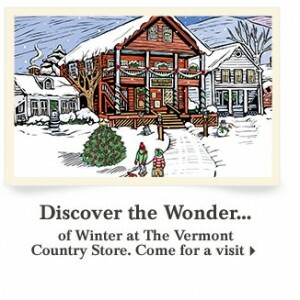 To compliment the catalog mail order business Vrest and Ellen Orton opened The Vermont Country Store in Weston which was inspired by childhood memories of Vrest’s fathers’ General Store in North Calais Vermont that opened in 1897. The Weston shop was the first restored rural general store in the north! “I can still remember my father’s store, where most of the men came in the evenings to wait for the horse drawn stage that brought the mail from Montpelier thirteen miles away” Vrest recalls. “The store was warm and cozy. It smelled of harness, coffee, smoky kerosene lamps, tobacco and pine wood burning in the big stove”. Today, the Vermont Country store is owned by Lyman Orton and sons Cabot, Gardner and Eliot, 7th and 8th generation Vermonters and 4th and 5th generation storekeepers. They still adhere to the old fashioned values set forth by Vrest and take pride in being the purveyors of the practical and hard to find. The Vermont Country Store serves a global economy and searches throughout the nation an abroad to fine goods that fill the needs of American and international customers. They are known for Apparel, Home Goods, Food and Candy and more! They also have a second location in Rockingham, Vermont. 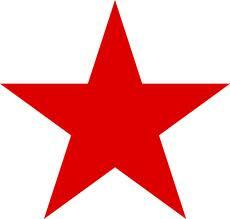 That Little Red Star that is Macy’s logo was first tattooed on the hand of Rowland Hussey Macy, Sr. (1822-1877). Rowland was one of six children born to the Macy family; one of the first families to come to Nantucket. At the age of 15, Rowland Hussey Macy Sr., worked on the whaling ship the Emily Morgan and had a RED STAR tattooed on his hand which would latter become part of the stores logo. Between 1843 and 1855, Macy opened four retail dry good stores from Nantucket to Haverhill, Massachusetts. Macy then moved to New York City in 1858 and established a new store named R.H. Macy Dry Goods at the corner of 6th Avenue and 14th street; Known to many today, as Union Square. On the company’s first day of business on October 28, 1858 sales totaled $11.08, equal to $298.41 today. As the business grew, Macy’s expanded into neighboring buildings, opening up more and more departments, and used publicity devices such as a store Santa Claus, themed exhibits, and illuminated window displays to draw in customers. The store also produced its own made-to-measure clothing for both men and women, assembled in an on-site factory. The store later moved to 18th Street and Broadway, on the “Ladies Mile” elite shopping district of the time, where it remained for nearly forty years. In 1875, Macy took on two partners, Robert M. Valentine (1850–1879), a nephew; and Abiel T. La Forge (1842–1878) of Wisconsin, who was the husband of a cousin. Macy died just two years later in 1877 from Brights’s Disease the following year La Forge died and Valentine died in 1879. Ownership of the company was passed down through the Macy family until 1895, when the company, now called “R. H. Macy & Co.”, was acquired by Isidor Straus and his brother Nathan Straus, who had previously held a license to sell china and other goods in the Macy’s store. In 1902, the flagship store moved uptown to Herald Square at 34th Street and Broadway, so far north of the other main dry goods emporia that it had to offer a steam wagonette to transport customers from 14th Street to 34th Street! They are used for camping, lighting the night on a patio or outdoor space, emergency lighting, and for decorating, of course! Decorative lanterns exist in a wide range of designs. Some hang from buildings, while others are placed on or just above the ground. Lanterns look even more dramatic and illuminating; of course when several are grouped together or hung in a decorative fixed manner. A primitive form of candle lantern, made from white horn and wood and called a lanthorn, was first made in the time of the English King Alfred the Great (849–899). Lanterns are first spoken of by Theopumpus, a Greek poet, and Empedocles of Agrigentun. Lanterns were used by the ancients in Augury. Lanterns are used in many Chinese festivals. During the Ghost Festival, lotus shaped lanterns are set afloat in rivers and seas to symbolic guide the lost souls of forgotten ancestors to the afterlife. During the Lantern Festival,, the displaying of many lanterns is still a common sight on the 15th day of the first lunar month throughout China. In Chinese festivities, the kongming lanterns can be seen floating high into the sky during festivities.